Orodispersible films (ODF) are a novel dosage form. Since 2012, they are monographed in European Pharmacopoeia (Ph.Eur. 7.4). Despite the fact that there are several film products available on the market, there has been no specific test method defined to characterize this dosage form. 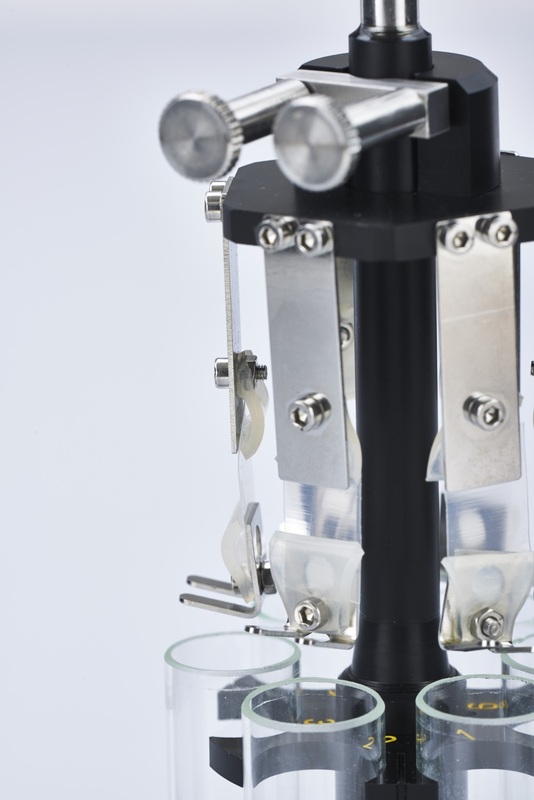 The PT-ODF test basket for the PTZ AUTO EZ tablet disintegration testing instruments closes this gap by offering a simple and affordable device to reliably test the disintegration times of films. 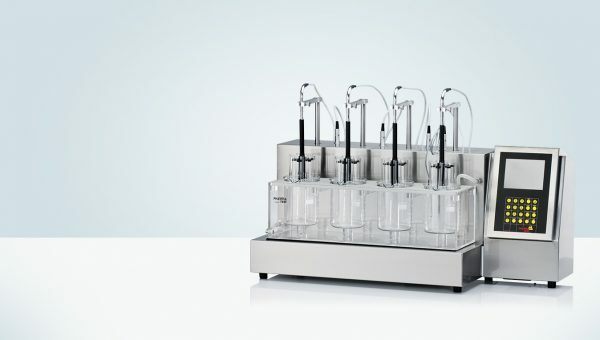 The PT-ODF basket can be used with any existing Pharma Test PTZ AUTO EZ instrument without any need for modification. It is attached directly to the PT-MKT electronic test baskets. A three position version for larger films is available as well. This requires a three position PT-MKT33 basket to use. The films are held in place by clamps. Small weights are attached to the films and fall down once the film has disintegrated. 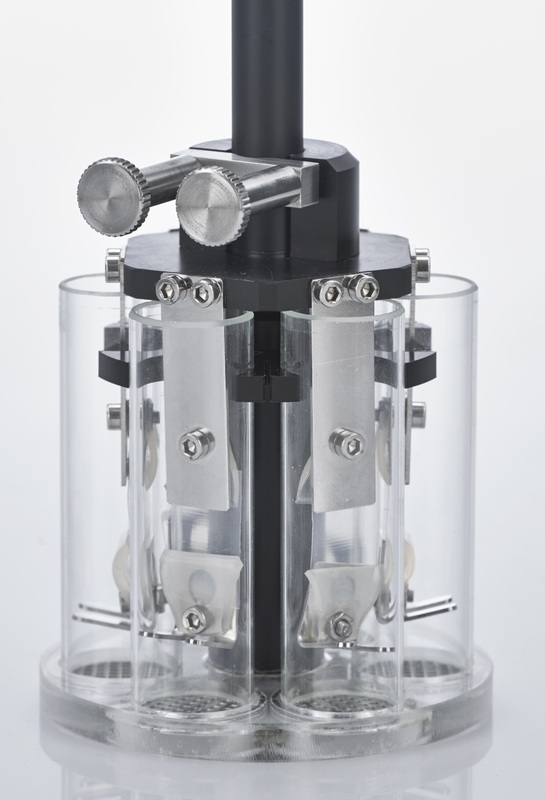 The PT-ODF connected to the disintegration basket moves up and down in the test medium (demineralized water, at 37±0.5 °C) in the test vessel inside the PTZ AUTO EZ disintegration testing instrument. Once the films start to disintegrate (e.g. dissolving, swelling, tearing), eventually they cannot hold the clipped weight anymore. The sinking of the weight to the test beaker bottom indicates the end-point, which is automatically detected via an electronic contact mechanism. The weights hit the split metal sieve of the PT-MKT basket and close an electrical circuit. The instrument detects this and automatically logs the disintegration time. The picture on the left shows the weights on top of the split sieves of a PT-MKT basket. The PT-ODF basket add-on together with a PTZ AUTO EZ disintegration testing instrument is a novel and robust test method to evaluate the disintegration of films enabling a clear end-point detection.